RS485 BUS actuator on DIN rail, programmable through Control panel Programming Software for rolling shutter or lighting control. Compatible with Amica control panels. Version for rolling shutters: management of two rolling shutters with max 250 Vac-voltage and 10 A current. 4 NO outputs + 10 inputs for local opening/closing 1, stop and safety 1, local opening/closing 2, stop and safety 2, remote controlled opening/closing. Functions: overvoltage protection and Soft-Start always active. Selectable Low Power. Version for lighting control: management of four lights with max 250 Vac/250 Vdc voltage and 10 A current. 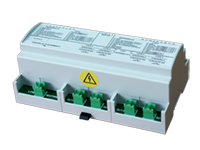 4 NO outputs + 10 inputs for Light 1 Switch/Dimmer, Light 2 Switch/Dimmer, Light 3 Switch/Dimmer, Light 4 Switch/Dimmer, Light 1 Button/Dimmer, Light 2 Button/Dimmer, Light 3 Button/Dimmer, Light 4 Button/Dimmer and two L1-L2-L3-L4 step-by-step buttons. Overvoltage protection always active, AC Dimmer (Leading edge) and DC Dimmer (through 0-10 V voltage) to adjust the brightness, independently selectable for the 4 lights.